Yelp Chicago — Valerio Dewalt Train Associates, Inc.
Yelp, the top ranked user driven review and recommendation website and app, occupies a significant corner of theMart, overlooking the nexus of the three branches of the Chicago River. The Mart, a small city within itself with a daily population of 15,000, has become a hub of tech companies looking for an urban environment with floors large enough to accommodate growth. Yelp’s business, at its core is, is fueled by the candid, varied opinions of the masses. Sometimes polished, sometimes tarnished, these consumer reviews expose and reveal their unvarnished personal experiences of commerce. Yelp’s offices embrace a similar exposed honesty in the design of the workspace. Layers of past finishes were stripped from the columns and ceilings to reveal the bare structure. Mechanical systems are left uncovered to feature their messy vitality. New finishes were selected to complement this raw and vibrant expression of the urban condition: rough clay tile, hefty timber planks, and bolted steel beams evoke an urban aesthetic. New room enclosures are simple, bold, and utilitarian. Community spaces are detailed to recall bridge structures and transit framework. 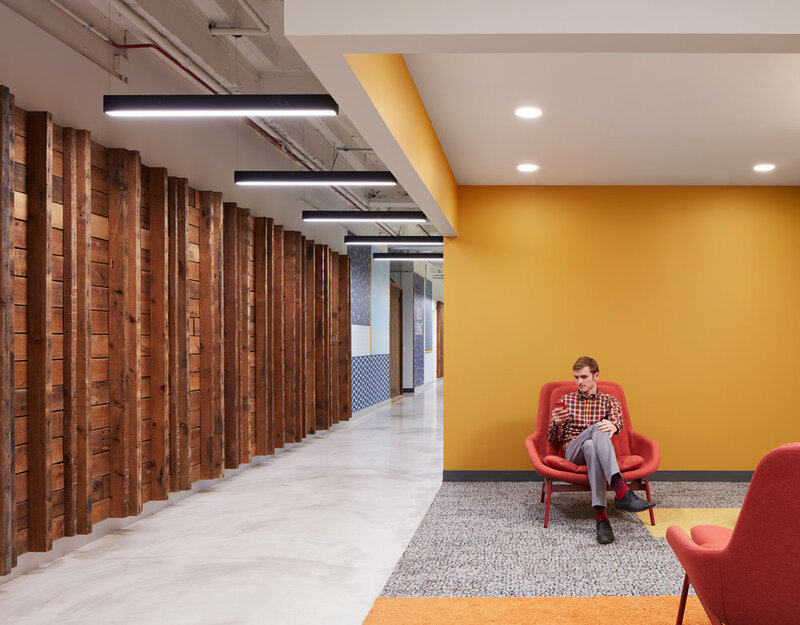 A central corridor, connecting auxiliary paths through the office, features pops of red accent color recalling Yelp’s iconic burst logo. 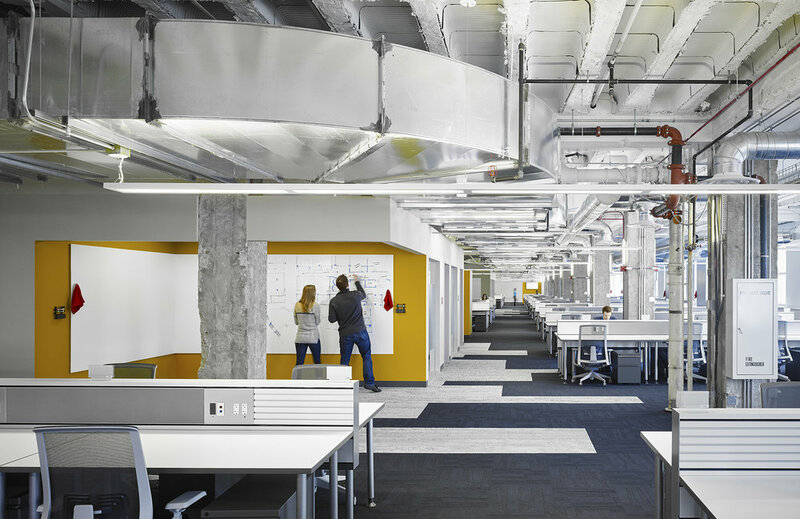 This first phase of offices occupies 50,000 sf of space for 375 employees of Yelp’s growing presence in Chicago. In addition to conferencing and teaming areas and 100 seat training room, the offices feature a 180 seat break area with full-time coffee bar, post-work beer bar and game room.